A couple's ambitious project to build a home inside an old church has taken an effort of biblical proportions. 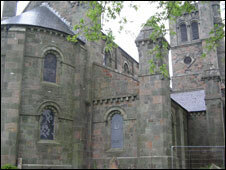 Karl and Natalie Meredith have so far spent five years working evenings and weekends on the Grade-II star listed Christ Church in Welshpool, Powys. After the two-storey family home is ready in 18 months, the couple hope the conversion will eventually include a concert venue and exhibition centre. "It's a once in a lifetime opportunity," said Mr Meredith. The couple had moved from the relative normality of a bungalow in Llanidloes with their sons Owen, 12, and Fred, four. From the outside it looks like an average church. The graves are neat and tidy, the grass has recently been cut, but inside a hugely ambitious project is starting to take shape. 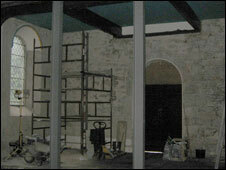 Pews have been taken out, walls are being re-plastered using traditional products and methods, and girders to support their home's walls are being put in place. But before we get carried away with the magnitude of the scheme and the sacrifices made by the Merediths, why did they buy a church? "I'm an engineer by trade and I found out that the church had closed and was falling into disrepair," said Mr Meredith. "I felt I had to do something about it and went home and asked Natalie what she thought and we eventually agreed to go for it. "We understood it was a huge project and we're glad we took it on." Mrs Meredith said: "The feeling was that we had to grasp this opportunity and there was a sense we just had to go for it. "It's an historic site and on Welshpool's tourist trail so we get quite a few visitors who are quite surprised at what we're doing. "We also know most of the graves now because we've helped so many people researching their family tree." After moving in 2003, the Merediths immediately set about building a temporary home inside the 169-year-old place of worship, which has become lovingly known as The Hut. "One of my first jobs when I got here was to repair the roof, because at one point we had 25 buckets dotted around the floor" said Mr Meredith. Despite their efforts the end seems a long way off, and even the Merediths say the timetable is flexible. After the four-bedroom home is finished in about 18 months, they then intend starting a three-year project to re-roof part of the church. Plans to reopen it as a concert hall and exhibition centre might take a bit longer.